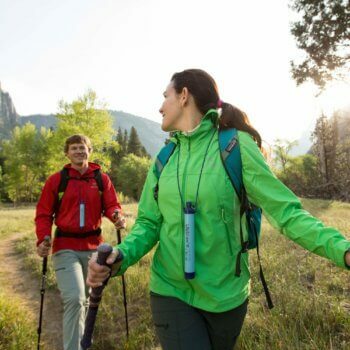 The LifeStraw Personal Water Filter has popularized the straw style water filter and has become synonymous with the idea of the lightweight backpack water filter. It’s ease of use, l0ng life span, and low-cost combine to make this one of the most popular and versatile water filters out there right now. 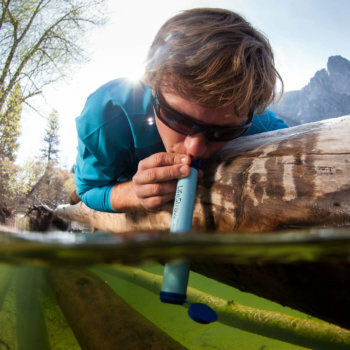 Who should be Interested in the LifeStraw? One of the least expensive water filters out there! Eliminates almost all bacteria and parasites. No way to tell if the inner filter has been damaged. Who should be Interested in the LifeStraw Personal Water Filter ? Anyone looking for a light-weight, highly portable, water filter should be interested in the LifeStraw water filter. It’s great for backpacking, mountain biking, and emergency kits of all kinds. The LifeStraw Personal Water Filter removes more than 99% of all bacteria and parasites. This means it takes out 99.999999% of waterborne bacteria (this includes e.coli and salmonella) and 99.999% of waterborne parasites (including giardia and cryptosporidium). It also removes all but the smallest microplastics and sediment. The long life span of the filter means that it can filter 1000 gallons (4000 liters) before it needs to be replaced. This is an estimated 5 years of drinking water. Uses a hollow filter microfiltration membrane style filter. The filter is 9″ long, 1.2″ wide and weighs in at a little under 2 oz. The LifeStraw Personal Water Filter has a ton of things going for it. Its ability to filter almost all bacteria and parasites from even the worst water source makes having one around a no brainer. It takes up almost no space and weighs next to nothing. Another great thing about it is the fact that it’s so simple to use! Simply stick it in a water source and you can begin drinking immediately. There’s no need to do anything else to the water and there are no special steps to take in order to set the filter up. The LifeStraw is also completely recyclable. This isn’t on my list of important features for survival gear, but it certainly doesn’t hurt. Add on the fact that it has a ridiculously long lifespan and is really inexpensive and you have a really great product. 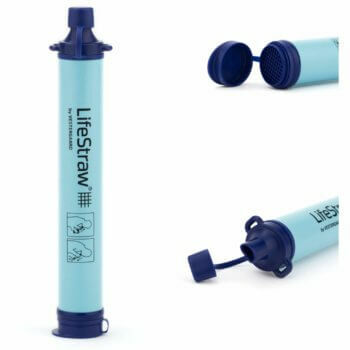 The LifeStraw Personal Filter comes with the same drawbacks that plague most filters of this type. The filter is pretty sturdy for just being made of plastic, but the filter element inside can potentially break if it’s dropped or slammed around a lot. If it does break, the filter won’t function anymore and there’s no way to tell from the outside if the filter inside is broken or not. I’d recommend replacing it if it takes any kind of major impact. You should also take this into consideration when you’re packing it into a backpack. Keep it padded if possible and try not to rough handle it. The LifeStraw Personal Water Filter is one of the best lightweight filters out there. It’s inexpensive and has a long track record of satisfying customers. The first thing to think about prior to purchasing the LifeStraw is what you want it for. If you need to regularly filter large amounts of water, then this isn’t the type of filter you should buying. There are much better options out there for filtering water in camp or for a family during a SHTF situation. 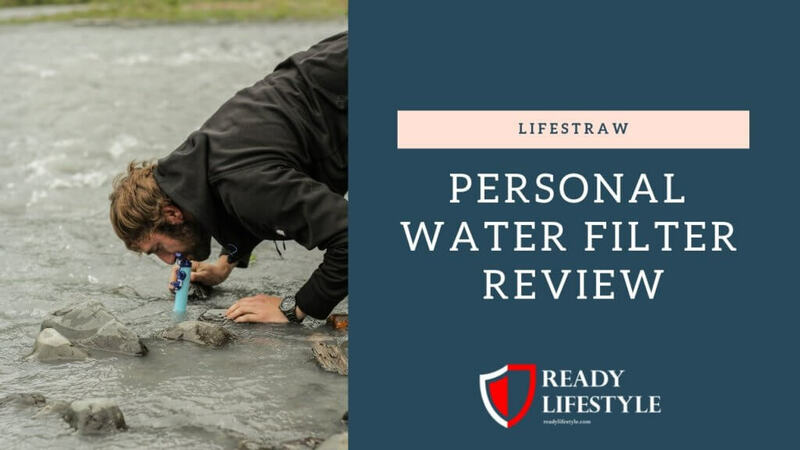 If you’re looking for a simple filter that will last a long time and can be used during hikes or thrown in a bug out bag, then the LifeStraw Personal Water Filter should be high on your list of options. Did this LifeStraw review help you make a decision on which water filter to purchase? Let us know in the comments section below!